Mutleys Hangar © Joe Lawford 2006 - 2008 All Rights Reserved. So impressed thus far, I decided to continue on my sojourn to the other side of the airfield, towards a rather fine house and the control tower. Upon arrival, the detail of the house was incredible, very fine indeed, as was the control tower. Some more members of adoring public waving at me, such is stardom! Actually on my ‘travels’ the flora, especially the trees were presented in excellent detail and beautiful colours that enhanced the realism and visual effect. Time to appreciate this airfield from aloft so line up and off we go, I climbed to 800 agl, and settled into some serious circuits looking down on Denham. What I immediately noticed is that there is detail beyond the immediate borders of the airfield that provided a spread of detail. Some airport scenery packages I have experienced an adverse effect, as soon as you go outside the border the scenery detail simply disappears, not here, there is a nice transition of detail that extends well beyond the limits of the airfield. An effect that Just Flight have introduced to great effect in recent offerings is some vehicles travelling along roads, and simulated motorways. Plenty here guys! On one of the approaches into Denham on finals, one could see the vehicles moving, yup, I like this effect, it certainly adds to the ambiance of the package. I briefly mentioned above the colours of the trees and ground flora, some obvious attention has been bestowed on this area of detail, because the colours are very realistic indeed, the trees especially had a realistic look about them. There are some lovely winter textures, the effect, well it looked very cold! As you would expect there is an array of fencing around the perimeter covering most of the airfield and the detail again was very nicely presented. I have not mentioned dusk dawn or night effects, I did select dusk conditions and understandably the lighting was shown to great effect, but you have to remember this is GA field and as a consequence it does not have complicated runway and taxing lighting. 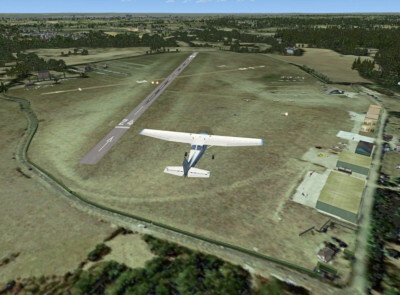 If you are looking for some scenery enhancement and a great GA airfield with beautiful detail within FSX, then you will love this cute little number. Ok, it is great to fly into and out of major airports, but equally, as far I am concerned, great to do some VFR flights in and around a private airfield and one with so much detail. I did not experience any major issues surrounding frame rate hit, but there was one flight that I noticed a drop in frame rates, but oddly that was the only occasion. All other flights have been smooth. I was about to say it would have been nice to see more movement on the field, but I guess there is plenty. It is after all a GA airfield. I love this offering, why? I have flown in and out on several occasions, so I have a love affair with it. 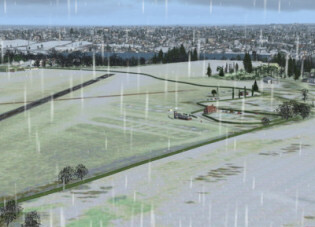 I sincerely hope this is one of many airfields that receive the same level of detail and realism and supported by us, the simming public. 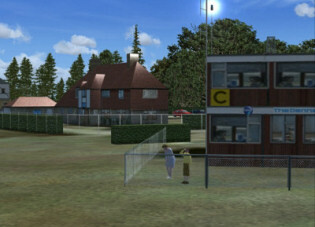 After all we are always seeking more realism to enhance the experience, for those who like GA airfields, you will not be disappointed with Denham. A great job, at a very realistic price, I only hope we will see many more Airfield releases over the coming months.